Determined coaches and runners at Minneapolis Henry, St. Paul Washington and Brooklyn Center are re-establishing the sport amid myriad challenges. More than a cross-country meet, the Fridley Peach Run on Sept. 6 showcased three programs in various stages of rebirth, re-dedication and revival. Minneapolis Henry, St. Paul Washington Technology Magnet and Brooklyn Center all competed, and their presence owed to determined runners and coaches alike. A year ago, low numbers prevented the Henry boys and Washington girls from earning team scores at the two-mile Fridley meet. Brooklyn Center didn’t even compete at the varsity level last season, opting for practices and mock meets to help fledgling runners along. Coaches at these programs recruited athletes and encouraged modest growth within a supportive environment. A growing number of athletes bought in and discovered the benefits of cross-country running. Noel hopes her team of 18 runners will grow to 50 by the 2022 season. Hang in there, Minneapolis Washburn Curtis Johnson urged. His Millers’ program is thriving, 100 kids strong and led by defending Class 2A state champion Emily Covert plus returning all-state runners Grace Dickel and Caleb Haugland. But it didn’t always look so promising. Johnson had just 14 kids when he began 11 years ago. Getting there won’t be easy. Attracting athletes at public schools in the city (Patrick Henry, St. Paul Washington) or first-ring suburbs (Brooklyn Center) has proved challenging. Even Farmington, a growing suburban community with a high school building less than a decade old, has struggled to draw desired numbers. Noel, whose program is a cooperative of Henry, Edison, North, FAIR School and Heritage Academy, noted the footwear worn by some runners on the first day of practice. Basketball shoes. Keds. Crocs. None exactly designed for heavy mileage. Donations of shoes and wristwatches helped equip Noel’s runners. Cultural norms and expectations ­— especially of would-be female athletes — are equally challenging. Coaches said many females of Southeast Asian or African descent play important support roles at home — from getting younger siblings off the bus to working after-school jobs — that cut into workouts and races. With just four girls on her team, Noel plans to connect with local youth programs Girls on the Run and Heart & Sole to increase numbers. A smaller number of female runners was a main driver in Farmington head coaches Adam and Lisa Lippold to start the Youth Cross-Country Program for elementary students in grades four to six. 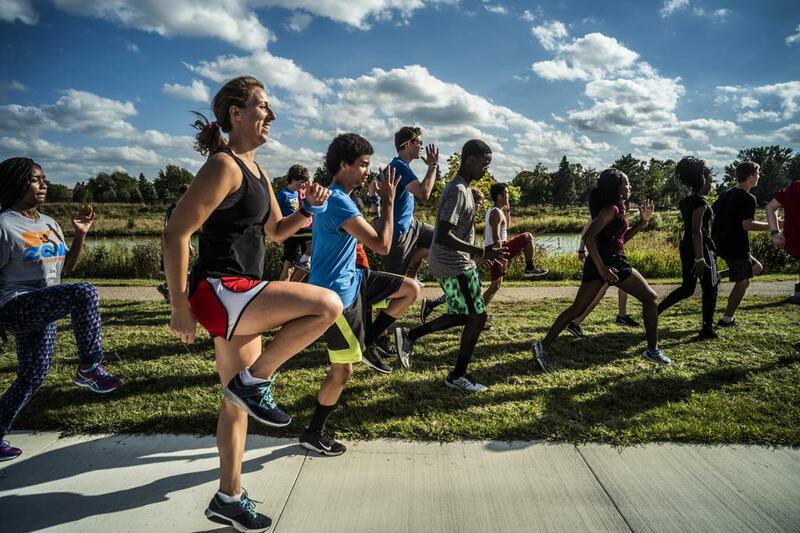 The program, started last year, increased from 30 to 50 runners this fall. Currently, junior high runners make up half of the 25 girls in Adam’s varsity program. The boys’ varsity, coached by Lisa, boasts 50 runners. Adam Lippold said the combination of varsity soccer, swimming, tennis and volleyball in the fall — in addition to year-round training in other sports — thins the girls’ population. “Getting them hooked early is our biggest hurdle,” said Lippold, whose team features 2016 Class 2A state champion Anna Fenske and all-state runner Lauren Peterson. Brooklyn Center coach Julie Hart said the recently opened Topgolf sapped potential runners who are instead pursuing employment. Hart said her understanding is that the Centaurs program dissolved about 15 years ago. A teacher who began planning the program’s restoration in 2016 left for another position, leaving Hart and co-head coach Caitlin Olson to complete the project. A home soccer match last week at Henry bumped cross-country training across the street to the half-mile jogging path around Camden Central Pond. Noel introduced V02 Max workouts, intervals designed to increase the heart’s ability to pump blood and oxygen to the muscles, thereby improving endurance. The runners formed various pace groups and took off. Runners have seen growth, too. Faster times aren’t the only measure of success. Henry senior Rah’quel Smith said struggles in the 400-meter dash during track season hurt her confidence. Cross-country has shown that she has more to give. Johnson said he built Washburn’s program by raising expectations. He added strength and conditioning sessions before school and instituted Saturday practices. While Noel, Hart, Nawrocki and other coaches are pushing kids to succeed, they also emphasize the team-as-a-family dynamic. A similar pride resonates on the north side of Minneapolis. “When you’re killing yourself in runs next to somebody and they’re killing themselves next to you, it’s a unique experience,” Henry sophomore Tenzin Choezin said. “But it’s worth it. It’s fun to explore and test your limits. Every day I look forward to practice.